Flor de Santiago, or Jacobean Lily, is an ornamental plant, that has medicinal properties, and which yields one single, very beautiful, deep scarlet red flower per stalk. Scientific name: Sprekelia formosissima (L.) Herb. Type of plant: Herbaceous, perennial and bulbous. Size of plant: Between 20 and 45-50 cm. high. Degree of difficulty for growth and treatment: Minimal. When it blossoms: Afternoon – night. Number of flowers per bulb: 1. Size of flower: Between 13 and 18-20 cm. Colour of flower: Bright scarlet, with sharp, pointed shiny gold dust. 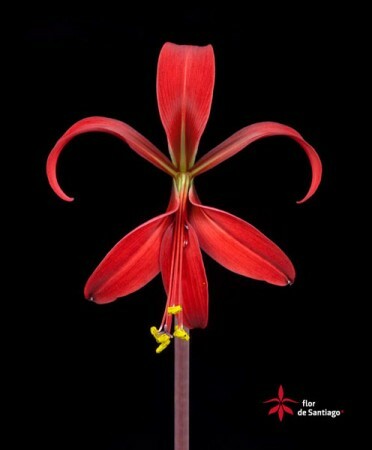 Shape of flower: A single flower with 6 red petals that are cross-shaped. The flowers are bilaterally symmetrical, like orchids. The 6 petals are free and very similar; 3 of them upright and curved backwards; the other three hanging downwards. Shape and colour of leaves: Green and narrow, like a strip or ribbon. Type of bulb: Tunic shaped, globe-like bulb, approximately 5 cm. in diameter, dark-brown or even black on the exterior. Time of year for planting: Inside, throughout the year. Outside, from the beginning of spring until the beginning of autumn, in mild, humid climates. The following temperature ranges can be taken as reference: minimum, above 10ºC and maximum below 35ºC. Type of under soil: Light, good drainage, rich in nutrients. For example: 1/3 sand, 1/3 earth, and 1/3 brier (heather). Type of pot: The volume of the flower pot will be approximately two litres, preferably height wise instead of breadth wise. Permeable pots are better suited, especially those that are not made with chemical substances. The flower pot chosen must have holes at the bottom to allow for the passage of water. Manner of planting: Use one pot per bulb. Plant directly in the pot, leaving approximately a third or a quarter of the bulb above the under soil. Place in the sun or in a sheltered environment, away from the sun; such conditions are more conducive to sprouting when it begins. The plant will take between 3 and five weeks to blossom, from the time of planting. Normally, the stalk of the flower appears before the leaves. When the first flower wilts, a second, or even third flower may appear, but exceptionally so, and this will only happen with bulbs over three years old and of the +16 category. The bulb can be left for as long as three years without being uprooted, in the same pot, but it must be protected from freezing winter temperatures. If it is left in the garden, please remember that it will not resist temperatures of less than 5 degrees unless it is given proper winter protection (duly quilted or padded). Water moderately at time of planting. Wait until plant begins to sprout, being careful not to add water unless the subsoil gets too dry. As soon as the plant appears, water more frequently, going gradually from moderate to normal. When the flower has fully blossomed, water less frequently, but never allow subsoil to get completely dry. When the leaves have completely wilted and are yellow in colour, put an end to watering and put the flower pot in a place with a temperature of between 9 and 13ºC, so that the plant may enter into a period of rest until the following year; or start preparing proper storage.If the plant is left in the garden, please make sure that the earth is quickly drained to avoid the bulb rotting through excess of water. Where it can be placed: In well lit interiors. In well protected domestic gardens. In exterior settings, directly open to the sun, or with light shade. Dangers: Rodents, moles or snails that feed on its rich bulb and/or leaves. Cats, because they love picking at and digging up and unearthing bulbs. Preparation for the storage of bulbs: Before storing, please check all plants to make sure that bulbs which are not in perfect conditions are not stored. Stalks, leaves and roots will be cut subsequently. Approximately 5 cm of roots will be left uncut. At the very end, bulbs must be cleaned of earth and be left completely dry. Storage of bulbs: The bulb may be stored in trays, Kraft bags, boxes or other systems that guarantee sufficient darkness and the exchange of vapour and water. Storage temperature must be preferably 9ºC, up to a maximum of 11-13ºC. The place of storage must be independent and must never be shared with other bulbs, food products, fruits, etc. It must also be free of strong odours and strong chemical substances. Never pile more than two or three heaps of bulbs one on top the other, to avoid rotting. When minimum exterior temperatures are right, we can then remove bulbs from the store room and plant them again. The recommended period for them to remain in the store room is at least four months. Method of multiplication: In keeping with bulb categories during the period of rest. These small sprouts will normally take three years to mature sufficiently and then blossom. The shoots can be planted in groups in order to properly monitor yearly growth. Fuente: Elaboración propia cos datos observados en Galicia durante o período 2007-2010. The total or partial reproduction of this document, as well as the generation of derivative works, is strictly forbidden without the prior written approval of the creator.